Little, Brown and Company, 9780316208260, 304pp. The question of our time: can we reclaim our lives in an age that feels busier and more distracting by the day? We've all found ourselves checking email at the dinner table, holding our breath while waiting for Outlook to load, or sitting hunched in front of a screen for an hour longer than we intended. Mobile devices and the web have invaded our lives, and this is a big idea book that addresses one of the biggest questions of our age: can we stay connected without diminishing our intelligence, attention spans, and ability to really live? Can we have it all? Alex Soojung-Kim Pang, a renowned Stanford technology guru, says yes. 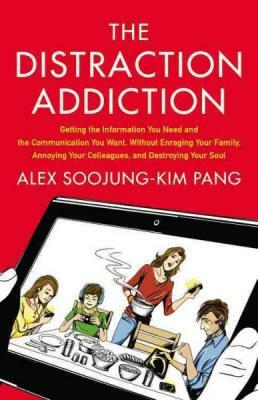 THE DISTRACTION ADDICTION is packed with fascinating studies, compelling research, and crucial takeaways. Whether it's breathing while Facebook refreshes, or finding creative ways to take a few hours away from the digital crush, this book is about the ways to tune in without tuning out. Alex Soojung-Kim Pang has spent the past twenty years studying people, technology, and the worlds they make. A professional futurist with a PhD in the history of science, Pang is a former Microsoft Research fellow, a visiting scholar at Stanford and Oxford universities, and a senior consultant at Strategic Business Insights, a Silicon Valley-based think tank. Pang's writings have appeared in Scientific American, American Scientist, and the Los Angeles Times Book Review, as well as in many academic publications.